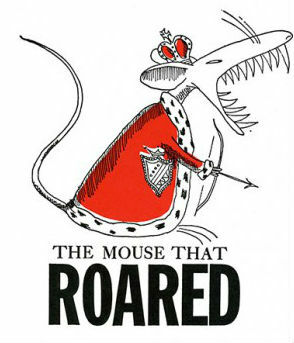 Melvin Trumble: the mouse that roared! Squeaking could be heard in Moscow. Russian strong man Vladimir Putin has been sedated by the Kremlin Quack following Malcolm Turnbull’s powerful rebuke to Russia over the poison gas business in Syria. Kremlin insiders have informed MM that Melvin’s words of wrath caused the president to cancel all appointments and now refuses to come out from under his bed. Vlado had apparently read an Australian newspaper report about the severe dressing down MrTurnbull directed at the CEO of AGL, Mr Vesey ,who commands the Liddell power generating station. The PM ordered Vesey to lower electricity prices. Vesey dared to treat our reigning waffler with contempt and foul expletives. From his pocket Malcolm pulled the lower portion of an emu’s leg sharpened to a point and aimed it at Vesey’s bald head while muttering, “uda-waddi-wid-wid-wid”, a well known death curse . The Kremlin called Aboriginal senator Dodson to ask if the powers of the”bone” could be “pointed” from Australia toward Moscow with fatal result. The senator’s reply was short and curt, “tell the ruskie drongo he’s a gonna!” DFAT is providing a translation. Prime Minister Malcolm Turnbull says Russia has to use its influence to make sure a chemical weapons attack in Syria is investigated and condemned. Prime Minister Malcolm Turnbull has warned Russia to ensure the latest chemical weapons attack in Syria is investigated. Russia has vetoed the United Nations Security Council investigating the attack in Douma, where up to 80 people were killed and hundreds more injured. “We call on Russia to use its enormous influence in Syria to ensure that this is investigated and those who have been responsible are brought to justice,” Mr Turnbull told Triple M radio on Thursday. US President Donald Trump earlier tweeted that America’s relationship with Russia “is worse now than it’s ever been” – including during the Cold War. Asked about that assessment, Mr Turnbull said it was a “very strong judgment”. “I think what he’s doing there is calling on his counterpart in Russia, President Putin, to stop this disruption of the international order and bring to an end these offences against international law and humanity,” he said. Mr Trump also told Russia there would be imminent military action, as Moscow warned any US missiles fired at Syria over the deadly assault on a rebel enclave would be shot down. “Russia vows to shoot down any and all missiles fired at Syria. Get ready Russia, because they will be coming, nice and new and ‘smart!’,” the president tweeted. “You shouldn’t be partners with a Gas Killing Animal who kills his people and enjoys it!”, he wrote, referring to Russia’s alliance with Syrian president Bashar al-Assad. White House press secretary Sarah Sanders later clarified “final decisions” had not been made. “We’re maintaining that we have a number of options, and all of those options are still on the table,” she said. Defence Minister Marise Payne said Australia had not been asked by the US to join military action, but would consider any “reasonable request”. “It is absolutely vital the international community stands up and opposes the use of chemical weapons in the strongest possible terms,” Senator Payne told ABC radio. She pointed to Australia’s support for last year’s response to a chemical weapons attack, which involved about 60 missiles being fired at a Syrian airfield. “They were targeted, they were measured and they were considered,” Senator Payne said. Mr Turnbull is expected to discuss the security situation with German Chancellor Angela Merkel and British PM Theresa May during a visit to Europe next week. Labor leader Bill Shorten said he would support action if it was similar to the “proportionate response” used by the Americans last year. “We can’t allow the use of chemical weapons against civilians to go unchallenged,” Mr Shorten said. Trump has been sucked into a false flag op for the deep state, who are much deeper than anyone thought possible. Turncoat and Shorted are fools for offering the use of our military for actions outside the constitutional allowance of military conscription, and are exposing our soldiers to criminal charges. Those photos of children did not show any evidence of chemical exposure, the pictures were very easy to photoshop and were most likely used by NGOs to lure the US into deeper involvement in an operation that does not affect US security. And certainly not our security. Possibly true luk? I agree that the situation could have been manufactured, planned, organised. But if it was it has fooled an awful lot of experts. Think I’d prefer to err on the side of a rational response. Lets face it Assad has form! The old witch’s trial – If you are claimed to be a witch then for your trial you could be ducked under water. If you die, you were innocent, but if you survive, then you are a witch and burned at the stake. I’m sure the Russians don’t even know who Trumble and the Stick Insect are. … and prolly threw in the girl-boy – ie Nancy boy – defence pair for more fun with Vlad. “Turnbull pledged his loyalty to Nelson but gave him absolutely none: he simply refused to accept the decision of the party room, and the undermining began immediately. Just after Nelson gave his acceptance speech, he was in his office with federal director Brian Loughnane, Julie Bishop’s chief of staff Murray Hansen and a couple of his own staff… Suddenly the door was flung open, with force, and in stormed Turnbull, yelling at Nelson and poking his finger at him, almost right into his chest. ROFPML at the opening paragraph! Very funny. Pity the rest is not so funny. Still no definitive proof that chemical weapons were used and yet the rhetoric gets ratcheted up and up. (We are sure there are Weapons of Mass Destruction there, Mr President!) Something will snap one day and it won’t be pretty. Ah, here it is, TA supporter with an anti-Turnbull introduction to an article with contributions by readers who do not offer a single alternative to the PM’s approach. TA’s office working overtime. Go on then, explain what is not right in my comment. Gee Don, does Mumble Trumble know you are using his computer again? You staffers are naughty boys. Absolutely right on Don. I hadn’t appreciated that Abbott was in cahoots with Vlad. Come to think about it maybe Tony was being all this gassing in the UK and Syria. Or even more, Doron (see, that’s funny; y’know, like combining ‘Don’ with ‘moron’ – and it MIGHT even be ‘hate speech’!! .. hopefully) ..
Perhaps TA was the instigator of the whole ISIS thing, and .. and.. maybe .. he started the Iraq war, and (pant, pant) .. maybe he’s responsible for urging Assad to gas his citizens previously (look it up) ..
An anon from 8 chan said that while Trump was bombing the chemical factory, [The Scientific Studies and Research Centre which includes Ted Turner and Edmund Brown on the board of directors and Warren Buffet as an Advisor] Russia was given cover to attack Deep State. As Trump said, “Mission accomplished”. This morning Josh Frydenberg thought it would be a good idea to mock and laugh at former Prime Minister Tony Abbott on national television. Well, he may live to regret that decision. Alan Jones has had enough of the Energy Minister’s duplicitous and smarmy behaviour, revealing the truth behind Mr Frydenberg. One of the Chairman’s boys. Thanks, DT. Jones & Co should be interesting tonight. I shall be watching, the best show on TV, Peta Credlin what a find for Fox, what a mistake for Turnbull not to listen to Jones . Jones will call them out good on Alan Jones, and little Josh , well he lost his soul. Hey, that’s nearly enough to fund another election campaign! But there is more …. It’s all in the fortune cookies, DT. SFX: RRRUUUUUTTTTTTHHHHHHH…..(explanation; A long, deep throated vomit emanating from the toes and exploding all over). Covers it all, really…including the foul smell.